Spoiler alert! Do not read on unless you're ready for a game changer! Combining the all-new Spektrum AirWare™ Touch app and robust DSMX® technology together with the intelligence of an Android-powered touchscreen, WiFi connectivity and more, the Spektrum™ iX12 is the new transmitter benchmark. 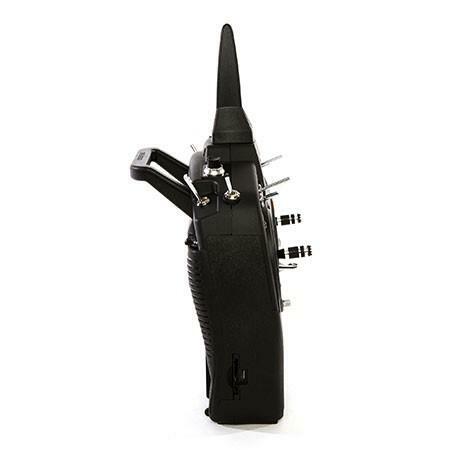 The iX12 radio from Spektrum has a combination of next-level connectivity and powerful easy to use features that will see this 12-channel transmitter become the new benchmark in the marketplace. Spektrum have listened to advice from the users and designed a transmitter that will be, not only comfortable and familiar but revolutionary in the level of technology it gives the user access to while in flight. The easy to read, 4-inch full-colour monitor on the iX12 is a fully integrated touchscreen capable of delivering crystal clear detail while making all the information at your fingertips easy to navigate. The Android interface system has its own quad-core processor enabling immediate response and it also facilitates the many and evolving number of apps available on the Google Play store. Your iX12 is easily connected to WiFi giving you access to download model setups, adding third-party apps, and, updating your Spektrum AirWare Touch app automatically. You can do a flying field check-in on Facebook before take-off, or, play some tunes on Spotify….all from the console of your iX12! The option of connecting to just about any Bluetooth device enables the iX12 to give you the opportunity of pairing it to speakers to listen to your music, or, use wireless earphones to hear any of your voice alerts. Photo and file sharing is also made easier. With micro-USB connectivity, you can adjust settings on your flight control board through your apps without the need for a laptop. 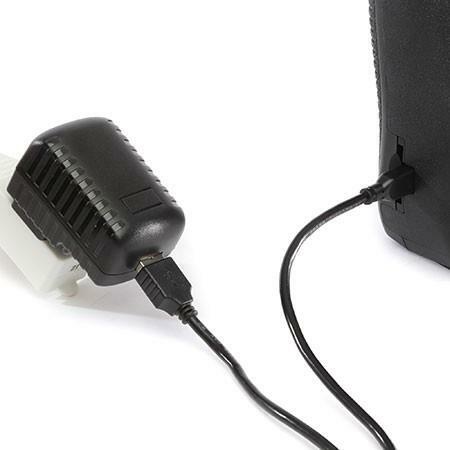 You can also charge the iX12’s Li-Ion internal battery through the micro-USB port using a common micro USB cable and power source. The iX12 will also recognise other accessory devices like your laptop or PC as well. Spektrum have made the programming transition easy for both their loyal users and first-timers. The Spektrum AirWare Touch app has been derived from the AirWare firmware that many are familiar with. Model set-up and menu navigation through the Android interface brings another level of familiarity with its big colour touchscreen making the switch to this high-tech transmitter even easier. 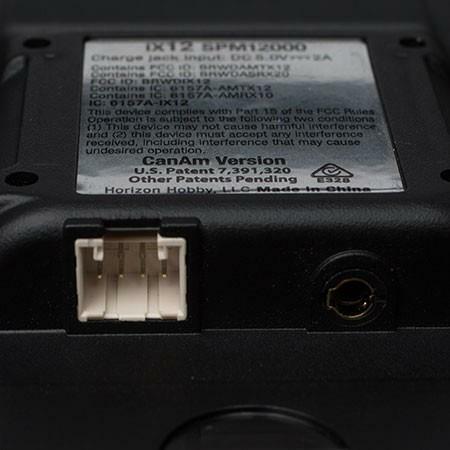 By utilising the integrated auxiliary serial port your iX12, through the use of a SPMA3090 adaptor, is able to link with a compatible long-range RF system like the Team Black Sheep Crossfire protocol technology (sold separately). This will give you secondary frequency convenience along with low latency performance. Keeping your eyes on the sky has never been easier! 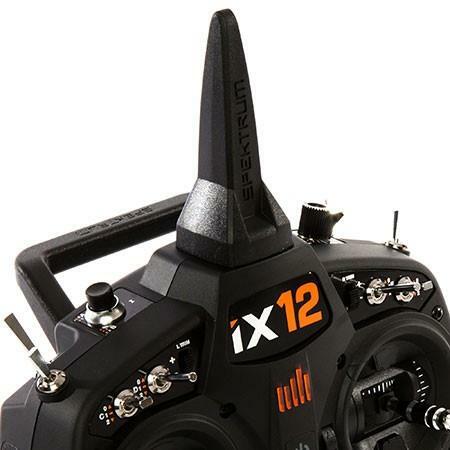 The iX12 has a fully programmable voice alert system that will monitor your transmitters important information. You can tell your radio to alert you to the telemetry info you require, mode selection and much more. You can customise your voice alerts through the keyboard by creating text-to-speech messages, or, transfer a.WAV file of any sound you want as an alert or reminder tone. The iX12 has a built-in headphone jack and a speaker so you can listen to your voice-alerts, or your favourite song, out aloud or for your ears only. You can also connect through Bluetooth to your phone or wireless earphones. 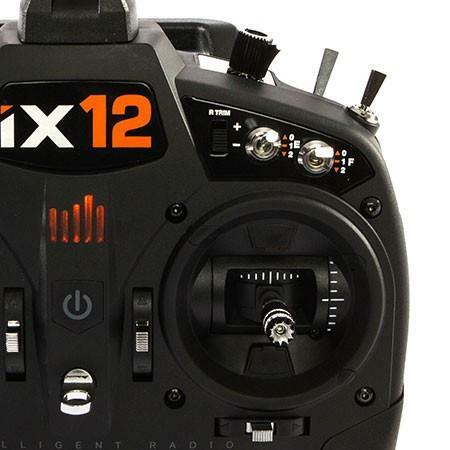 Based on extensive customer feedback and Spektrum team pilot recommendations the iX12 has been worked and re-worked in order to bring you a transmitter that feels great in the hands and is easy to use. Spektrum have set out to bring you a radio with an optimised sense of comfort, functionality and balance that enables the pilot to utilise the DSMX technology at their disposal to its fullest potential. 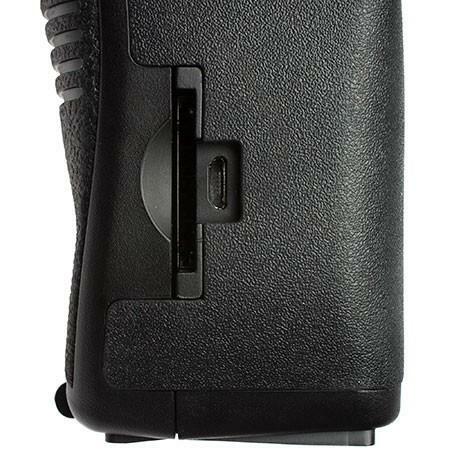 The improved ergonomic features include – user-adjustable push button power on/off and switch assignments, adjustable travel range and stick length, no-slip rubber grips, quad bearing gimbals adjustable through front access, easily adjustable mode configurations (1 to 4), and, the very latest in touchscreen technology. Practice on your favourite simulators by linking with the Spektrum wireless simulator dongle (SPMWS100 – sold separately). Allow someone else to line up the shot on your camera drone by assigning gimbal functions to a second camera transmitter. This will enable you to maintain visual contact with your craft and avoid obstacles. When teaching someone to fly you can wirelessly connect with a DSMX/DSM2 enabled Spektrum transmitter in a ‘buddy box’ fashion. 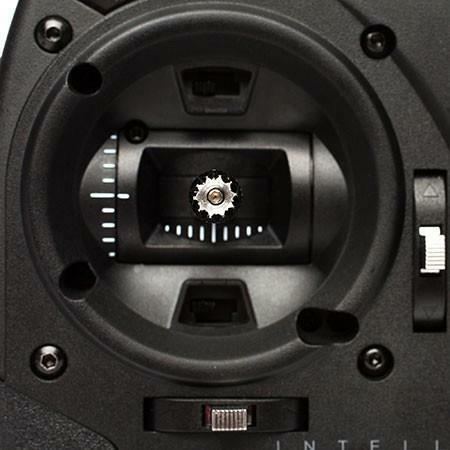 No longer do you have to take your transmitter apart to adjust your gimbals or change the modes over. You can now apply ratchet, travel and tension adjustments for each gimbal through the front of the transmitter. You’ll just need to lift off the rubber access cover to make simple adjustments. Helping customers become familiar with the iX12 has been made easier with Spektrum setting the functions up a lot like your smartphone. 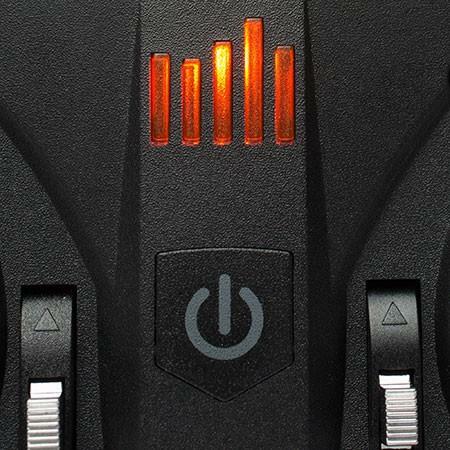 In much the same manner as your phone, you don’t have to power down your iX12. You just have to put it to sleep. With a touch of a button, it will come back online giving you access to all your options and apps instantaneously whilst conserving power in the interim. With the iX12 LED indicator light, you’ll always know your broadcast, sleep and charging status at a glance. Huge onboard memory enables the iX12 to store up to 250 different models without having to resort to additional models stored on SD card backup. Know what the status of your aircraft is at all times. Using the voice-alert system onboard the iX12 you can have the inbuilt telemetry system relay real-time data to you about any of the critical information in order to get more from each flight. With a Spektrum AR9030T (sold separately) installed you can define values and limits on such things as signal quality, motor temperature, battery voltage and more and your iX12 with let you know, through voice-alert, when you reach or exceed them. You can also get an instant update on telemetry values with the flick of a switch. If you have one of your favourite model setups sitting on your old DX9 you can now transfer it to your iX12 with Spektrum AirWare. You can also share model set up data from your iX12’s 250 model memory. The recipient only needs a Spektrum G2 transmitter with AirWare firmware. You can share model setups from your iX12 with any of the following Spektrum transmitters – DX6e, DX6 G2, DX6 G3, DX7 G2, DX8 G2, DX9, DX9 Black Edition, DX18, DX18QQ, DX18 G2, DX18 Stealth Edition, and, DX20. The AR9030T allows you to set up a one sensor system to receive all your flight log and voltage telemetry data from your outer sensors. 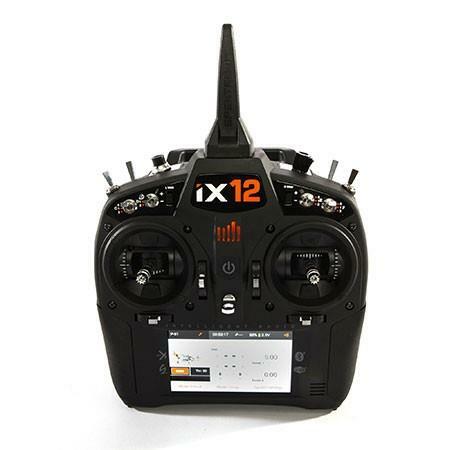 It is a 9 channel receiver that includes built-in full range telemetry connection ports for Temperature, RPM and Flight Pack Voltage sensors along with an X-Bus port for any additional telemetry options you may like to add. 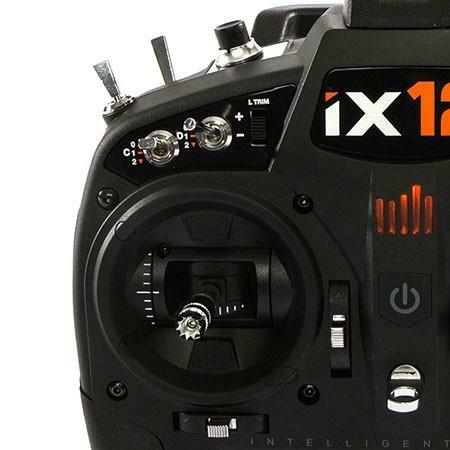 The iX12 comes with two DSMX remote receivers for you to utilise the patented Spektrum MultiLink system that gives you excellent signal diversity strength and gets rid of the possibility of antenna blind spots, and, reflected signal fading that 2.4GHz systems can be affected by. 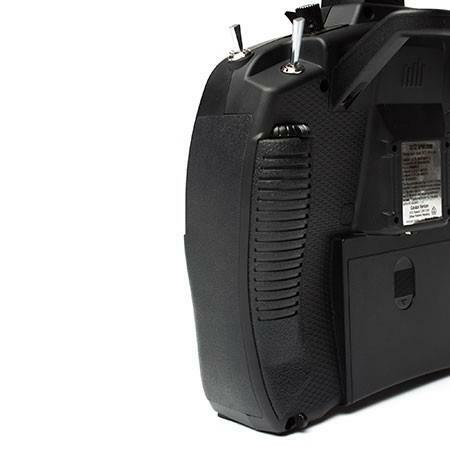 The AR9030T also delivers super fast input to output response that the iX12’s 11ms frame rate will put to optimal use when flying 3D airplanes and helis.